From ‘Street Life in London’, 1877, by John Thomson and Adolphe Smith, courtesy of LSE Library, No known copyright. Today, we take it for granted that we can walk into any main street pharmacist and buy high quality, safe and effective medications. Just over a single lifetime ago this was not the case. How drugs were manufactured, tested, labelled and sold was very different, and the raft of regulation and legislation that protect us now could not even be imagined. Most people would never have had the money to consult a doctor or an apothecary. Instead, they would rely upon the drugs they could purchase with their pennies and ha’pennies from street peddlers. 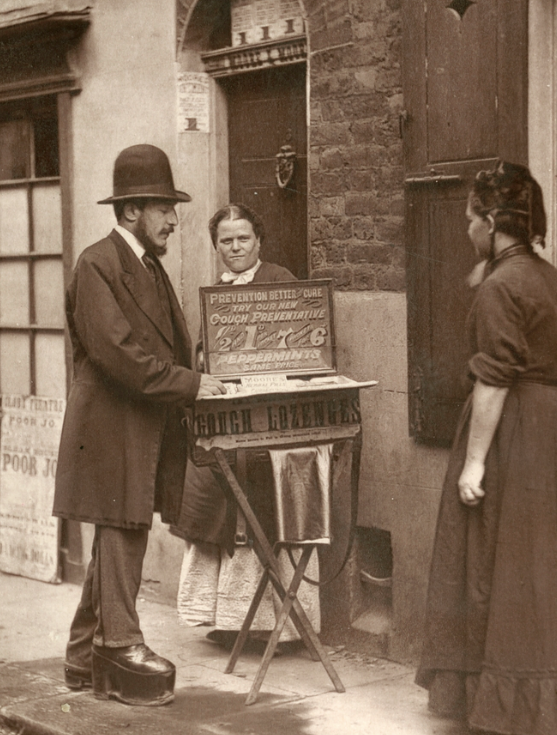 On the streets of Victorian London you may have bought medicines from the sort of peddler shown in the picture above. This street trader of drugs was photographed by the pioneering Scottish photojournalist John Thomson. Along with the writer Adolph Smith, he documented London street life from 1876-77 and they published their combinations of pictures and interviews in monthly parts. Their work has often been hailed as the forerunner of the modern documentary. Characters like this trader of cough lozenges and healing ointments have been known by many names, including quacks and mountebanks, but when Adolphe Smith interviewed ‘an intelligent member of the fraternity’, he learned what they called themselves. Regarding themselves as members of the medical profession, they communicated with each other in ‘crocus’ Latin and employed a cryptic nomenclature for their remedies. Of course such crocuses could also turn their hand to selling rat poison and household cleaners as well as remedies. The contents of this crocus’s pills, ointments and potions were closely guarded secrets, not least of all because the key ingredients were often worthless. However, even if you knew what was in the medicine you were using, there was no guarantee of its safety. The sale of drugs was unregulated and there was no need for any manufacturer to test their products before marketing to ensure their safety, nor indeed was there any compulsion to provide evidence for any claims of efficacy. This lack of control over the contents and their safety testing meant that you could be giving morphine to your teething child, or smoking ‘asthma cigarettes’ for the relief of ‘all diseases of the throat’ (but thankfully ‘not recommended for children under 6’). You might also sip a cocktail of codeine, cannabis and chloroform to relieve your cough. If the latter did not do the trick you could simply treat yourself with some over-the-counter heroin—again sold as a cough remedy. Today, even with calls to deregulate such drugs, it is hard to imagine that we would sanction the indiscriminate use of high doses of opiates for minor complaints in adults, never mind children. But, without any form of regulation, manufacturers of such drugs could advertise widely, making often largely unsubstantiated claims for the efficacy of their products. Even if there had been any form of quality assurance exercised during their drug’s manufacture, you would not have been able to check the contents of the product as the seller had no obligation to list the ingredients on the pack. 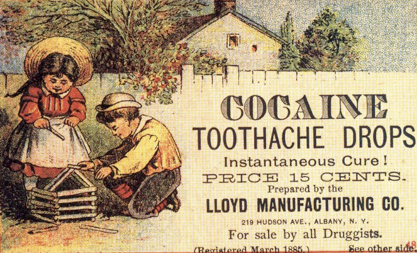 Drugs sold over-the-counter and prescribed by physicians and apothecaries could, and did, contain anything. But, think for a moment, what would our world look like if there were no drug treatments? First, the global population, which has recently passed the 7 billion mark would be less— considerably less. Deaths from many diseases, but especially infectious diseases would be high. The population would be on average much younger for the likelihood of reaching old age would be much reduced. The average number of pregnancies for each woman would be much higher as infant mortality would be high, as of course would be rates of maternal death in childbirth. Pain would be unrelieved, infections untreated, psychiatric diseases unresolved. Patients with diabetes could expect nothing like a normal life. Children with asthma would struggle and many would die from their condition. Sexually transmitted diseases would be rife and often ultimately fatal. There would be greater dependency on folk remedies and alternative therapies—only they would no longer be alternative, but mainstream. Medicine as a professional discipline would also look very different: built less upon a scientific foundation and more upon an unstable and shifting edifice of opinion and belief and faith. We do not have to work too hard to imagine this world for it was our world in the comparatively recent past. The explosion in drug development has largely been a story written in the last two or three centuries, and this narrative has been driven by many different factors. Yes, there have been commercial interests but there has also been a genuine desire to improve the health of the population and to relieve suffering. Lofty words that lose a little of their altitude when we think of drug scandals and the apparent deception and greed of some groups, but words that are nonetheless true. The development of new drugs is often driven in the first instance by a simple wish to help, and not simply to make money. Successful drugs will make, for those who develop and manufacture them, enormous riches, but it is also a very risky and expensive business. Huge speculative investment must be made to find and test the next drug. Many, if not most, contenders will fall by the wayside and only a tiny minority of new compounds will eventually find their way on to the pharmacy shelves. But, the regulation of this drug development is comparatively new and was often enacted as a response to scandal or catastrophe. ‘A desire to take medicine is, perhaps, the great feature which distinguishes man from other animals,’ wrote William Osler in 1891. Our pharmaceutical consumption has continued unabated since, and if we are to be assured that what we take with our glass of water before bedtime is safe and effective, we must thank the complex regulation of clinical research and drug regulation that protects us from crocuses. You can read more about the history of clinical research in my books Trial by Fire and On Moral Grounds, both available from amazon as a kindle download. Grammar should be like the background music in a film. If it’s good you hardly notice it’s there. If it’s bad, it jars and distracts you and does not allow you to focus on what’s important. We write to communicate our ideas, opinions and discoveries. If the way we write obscures these goals in any way then we have to rethink our approach. Some people think grammar is unimportant, being a secondary issue to the main thrust of their writing. However, if your use, or misuse, of grammar leads your reader to stumble over your meaning, you have failed. Grammar is important. Now, the Irish genius James Joyce is not necessarily an author we should be trying to emulate. In his masterpiece Ulysses the final chapter is over 24,000 words long and contains a single punctuation mark—a full stop at the end. Such writing may be at the high end of literary art (I myself believe it is), but it would not pass muster as any sort of formal or technical writing. Similarly, William Faulkner, the American author who won the Nobel Prize for Literature no less, appeared to have a morbid dislike of apostrophes. Perhaps he had been frightened by one as a child, but his reasons for preferring cant over can’t and oclock over o’clock should not sway us towards thinking that punctuation does not matter. Both Joyce and Faulkner knew the rules and chose, quite deliberately, to break them for artistic reasons. Their writing was not bad. Rather, it was exploratory, pushing-the-boundaries sort of stuff that you can get away with if you are at the genius end of the spectrum. As most of us are watching from the other end of the rainbow, I suggest we use standard punctuation. Any deviation from the norm on your part will not be so easily explained, nor will it be forgiven. Another, more practical reason for following the rules is that we are trying not to distract readers, reviewers and editors from the quality of our science with the pyrotechnics of our prose. When it comes to punctuation, there is much that could be said. We could spend time talking about the misplacing of commas, the misuse of the semicolon and we could spend the whole blog ridiculing the aberrant use of apostrophes, but the one punctuation mark that causes me the greatest chest pain is the exclamation mark. Put simply, exclamation marks have no place in good technical writing. My dislike of exclamation marks in writing such as scientific papers, reports, dissertations or theses is, I admit, visceral. Nothing in science should be exclaimed. Rather, it should be stated unequivocally, proposed or mooted. There is no place for this particular punctuation mark because there is no place for what it denotes, but alas my students and in some cases my colleagues disagree. I’m with F. Scott Fitzgerald, who said that using an exclamation mark is like laughing at your own jokes. 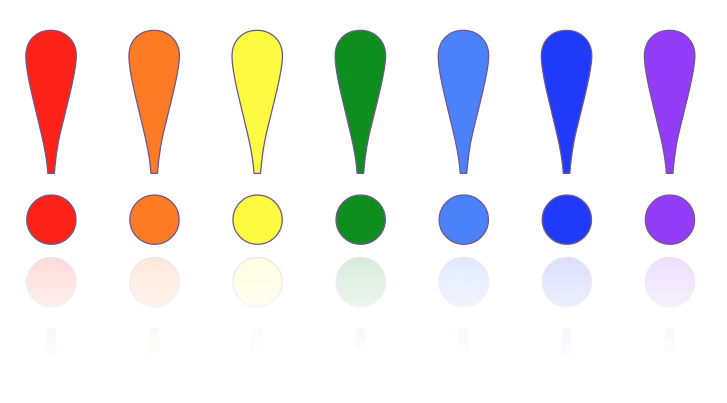 An exclamation mark may also be seen as a cymbal crash or as raising the volume of your words to a shout or a scream. Science, however, should never be screamed, but written about very much in an indoor voice. Exclamation marks do find their way into popular culture with alarming frequency. Oklahoma! is not the only stage musical with an exclamation mark in its title— Oliver! , Hello Dolly! and more recently the Abba-fest, Mamma Mia! deserve a mention. Westward Ho! is the only place name in the British Isles with an exclamation mark—one wonders why we have even one. Another, but this time in Canada, is the joyously named Saint-Louis-du-Ha! Ha! in Quebec, which is the only place name to rejoice in two exclamation marks. And, as for book titles, well there simply are no works of literature with an exclamation mark in the title. There may be some books, but they certainly aren’t literature. Now, if I should find myself having to write about an amateur production of Oklahoma! in Westward Ho!, then I will happily employ exclamation marks, but otherwise I will leave them in the punctuation drawer where they belong. And, don’t try to hedge your bets by putting exclamation marks in brackets (! ), for that’s just shouting with your hand over your mouth and is best reserved for text messaging. There are, of course, places where it is correct to use an exclamation mark, but these locations will rarely be found in you technical writing. If you find yourself writing a formal or technical piece that requires you to include animal noises (e.g. Grrrr! Quack! Oink!) I strongly suggest you pause for thought. Either you have misjudged the task in hand, or you need to rethink your profession. Such onomatopoeia will be grist to the mill of the children’s author or even the novelist, but rarely does the word Oink! appear appropriately in the academic literature. We may also use an exclamation mark appropriately to raise the volume of our direct speech, or rather our direct shouts, e.g. ‘What!’ he screamed. Again, while right for the novel, this is unlikely to find a place in the scientific paper. I think writers also use exclamation marks to add emphasis to their thoughts, or to convey their own surprise or disbelief. While it is important for the scientific author to guide his or her reader and to signpost the relative importance of different aspects of their topic, there are better ways to do this than to use exclamation marks. Similarly, if you can’t believe what you have read, exclamation marks just make you sound sarcastic. In short, there is no situation where an exclamation mark will add to your scientific writing. On the contrary, its presence will detract from it and will lead many readers, including this one, to conclude that you are not in full control of your keyboard and, therefore, by extension perhaps also not in full control of your facts. Doubts about your facts lead inevitably to doubts about your judgement and any conclusions you have carefully carved from your data. So, exclamation marks in scientific writing are nothing short of the first step on the road to perdition. Your intentions may be innocent, even good, but you know where good intentions lead you! If you would like more like this, why not take a look at WORDEASY: The Commonest Grammatical Mistakes in Formal Writing & How to Avoid Them. If you’ve never been within a few metres of an adult humpback whale, it is difficult to appreciate the enormity of it all. This graceful dinosaur of the sea was gliding through the Atlantic waters off the coast of Maine and gently manoeuvred alongside our flimsy ship. As he appeared to nudge the hull, he turned on his side to stare with an experienced eye at those who had come to see what majesty was all about. As he turned, he breathed out through his blow-hole, covering us in a fine mist of brine and the overpowering smell of fish. 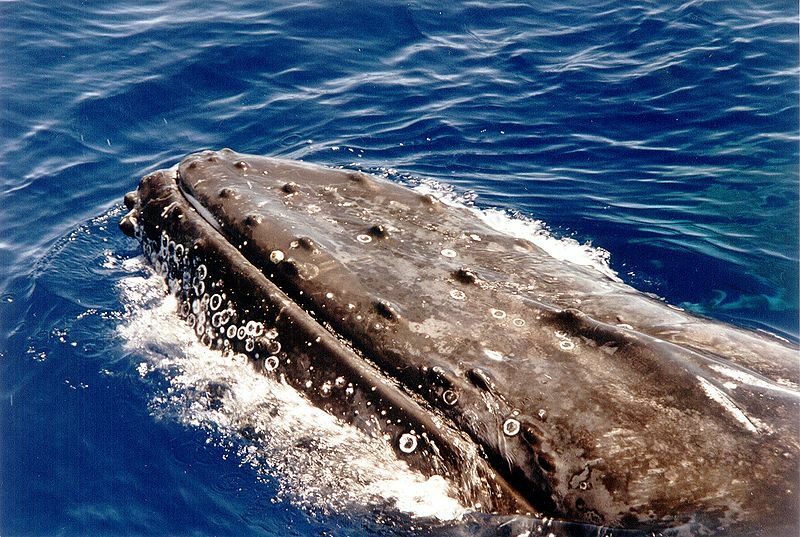 Quite why one should be surprised that a whale’s breath should smell of fish, I don’t know, but all of us gasped, perhaps because it made it real, and that bit less like some animatronic marvel from a theme park. The whale-watching trip had been the highlight of a weeklong stay in Bar Harbor (or Ba Ha Ba, as they say it there) in Maine, in the very top right-hand corner of the United States. It was 1993 and I was there to attend the Short Course in Medical and Experimental Mammalian Genetics, held in conjunction with The Jackson Laboratory. And, as it turned out, the whale was not the only dinosaur I would meet. The course at the time was famous and was run by the founding father of medical genetics Victor McKusick, from Johns Hopkins. His gravitas ensured that he had no difficulty in assembling a starry array of renowned speakers. The jewel in the crown of his faculty on this occasion was a keynote lecture from Stephen Jay Gould. Gould was an evolutionary biologist, a palaeontologist and, most famously, a prolific writer of popular science. His works, such as The Panda’s Thumb, The Flamingo’s Smile and Bully for Brontosaurus, could be found in any bookshop. He was to be the star attraction in a week of the great and the good in biology, and as his lecture approached the excitement grew. In the flesh, he was plump and greying and appeared older than his 51 years. Despite my anticipation, in truth, I can remember almost nothing about his lecture, save for two things, and neither was to do with its content. Shortly after he began to speak, there was a flash of photography. Gould stopped in his tracks and snapped back that he would not be photographed. This seemed a little odd coming from such a celebrity, but perhaps he was just having a bad hair day. A few moments later there was another flash and another halting of the proceedings as Gould looked into the darkness of the audience and repeated his “no photography” warning, adding the threat that he would not continue if this outrageous behaviour were to happen again. Most of us had stopped listening by now and were on the edges of our seats waiting to see what would happen next. Our anticipation was rewarded with a third flash, and this time we could see who the culprit was: none other than our distinguished course leader Victor McKusick, who had been merrily snapping away from the front row. Gould was incandescent, but even he had now seen the photographer, who smiled an elderly patriarchal smile and encouraged Gould, who was twenty years his junior, just to carry on. He did, but a little more grumpily than even before. The other thing I remember came after the lecture when I, with a few others, approached the stage to meet Gould and have our books signed. I had bought my copy of Bully for Brontosaurus the day before in the Bar Harbor bookshop, as I was keen to have a souvenir of the event and I also thought it would afford an opportunity to meet Gould. However, the book signing, like the lecture, failed to match my expectations. As I approached him, he was talking to someone more important than me and continued his discussion while he took my book without looking at me, without even looking at the book, and mechanically scrawled his signature on the title page. He pushed the book back at me without closing it and held out his hand for the next in line, still not taking his eyes off his partner in conversation or even acknowledging my existence. I stood for a moment for I had wanted to say something, to make some connection, but it was obvious this was not going to happen. I suppose I was just another junior scientist wanting an autograph; just another groupie. The older I get, the less dazzled I become. When I “met” Stephen Jay Gould I was ready to be impressed by a minor hero. I had read one of his books and was prepared to read the rest. When I found out he was to speak on the course I was attending I was excited. As it turned out, his lecture was dull, his demeanour grumpy and his manners lacking. I didn’t read any of his other books, although I still have my mechanically signed copy of Bully for Brontosaurus on the shelf. I have wondered since whether the cult of personality that I was helping along with my anticipation of his lecture is fundamentally detrimental to science. Did it matter that he was dull and grumpy, if his work was exciting and controversial? Should I have cared that he was rude, when I was assessing his contribution? I suppose not, but the reality is that I know I would have read more of his books if we had only exchanged a few words on that summer evening in Maine. Older scientists should be wary of the impact they can have on the young. Their enthusiasms can ignite new fires in minds they touch, even fleetingly, or their indifference can douse any spark. If you want your subject to have a tomorrow, then take care to start fires. And me? I met a humpback whale in Bar Harbor. I also met Stephen Jay Gould, but only one of them looked me in the eye, and that made all the difference.